PM Modi Answer To Gandhi Family - Due To Demonetization Rahul And Sonia Are On Bail: 12/11/18 Prime Minister Narendra Modi has reversed in an election alliance between Congress constant attacks on the completion of two years of notebandi. Before the second phase of elections in Chhattisgarh, PM Modi done a rally in Bilaspur. During this time, the PM took the Gandhi family to target the notebook. During the address, he said connecting Congress with notebandi and said that those who are roaming on bail in the racket of money-laundering that mother and son will give a certificate to Modi. The fake companies were caught because of the demonetization, due to which got bail. 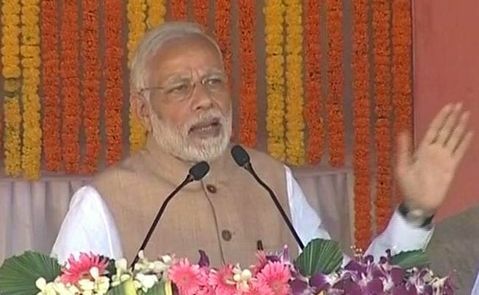 PM Modi said, 'Those who are accused of corruption, who do not have to do any work other than corruption ... we have to go on the path of development. Ever ridicule the clean India, make fun of tourism ever. Our objective should be to educate children, earning youth, irrigation to farmers, medicines to the elderly, they should be fully managed. " Narendra Modi said that today in Chhattisgarh, the Bharatiya Janata Party is getting the blessings of the people. One of the reasons for this is the strong link between public life and organization workers.